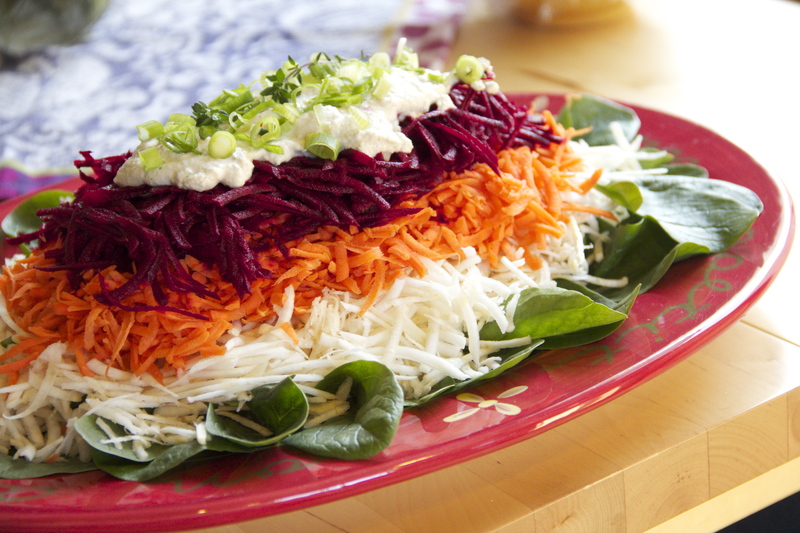 Today we are going to get a little more gourmet and give you recipes for a Beautiful Borscht Salad, Cashew Cream Dip and Flax Crackers. 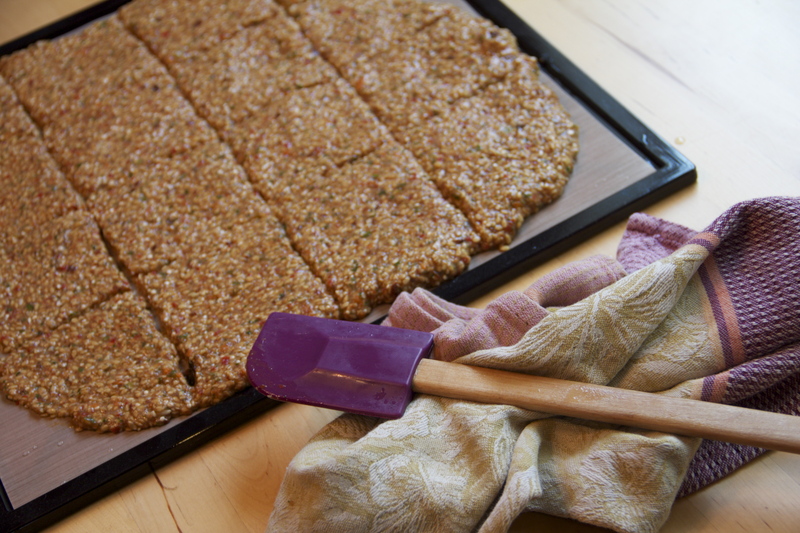 You will need a dehydrator for the Flax Crackers or you can buy some at your local co-op or online. 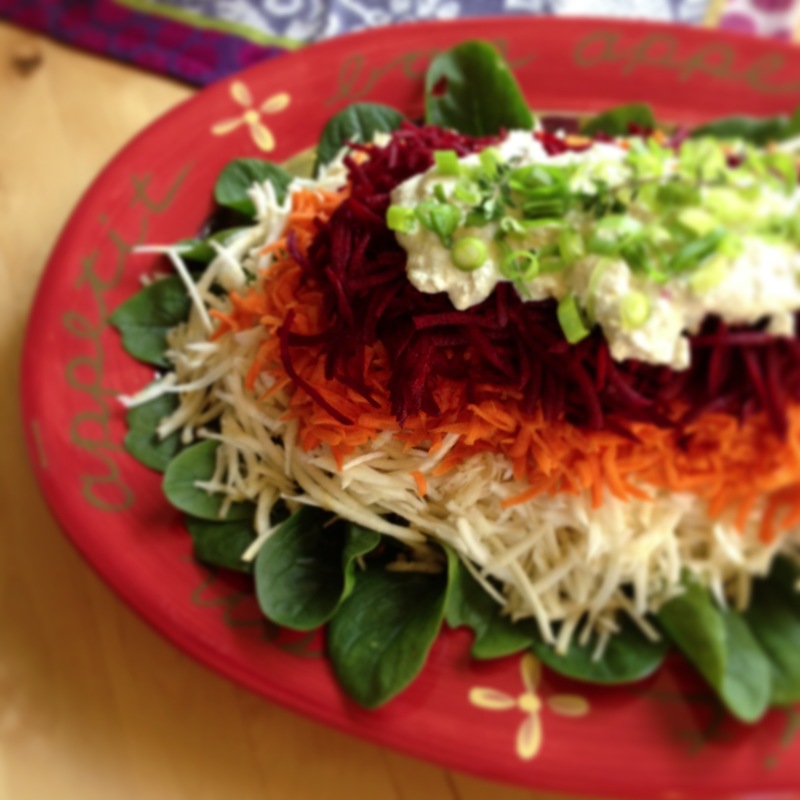 I made Lisa Pitman’s Beautiful Borscht Salad and a Cashew Cream Dip with Flax Crackers for Easter this year and all items were a big hit! So tasty even to the eyes! This salad is quite beautiful and very tasty. Layer fresh washed and spun dry spinach on a large platter. Peel the root vegetables for the most vibrant color! Grate celeriac and layer on bottom, then grate carrots and put as next layer and then do the same with the beets. Use your food processor shredding blade to make this up in just a few minutes or grate by hand. Top with Cashew Creme Dip (recipe below) and chopped green onions. Soak cashews in water overnight, then drain and rinse. Blend cashews with fresh filtered water in blender for about 1 minute. Place in bowl or jar with room to spare. Cover tightly with plastic wrap and rubber band to seal but allow fermentation expansion to occur. Set in a warm location overnight. 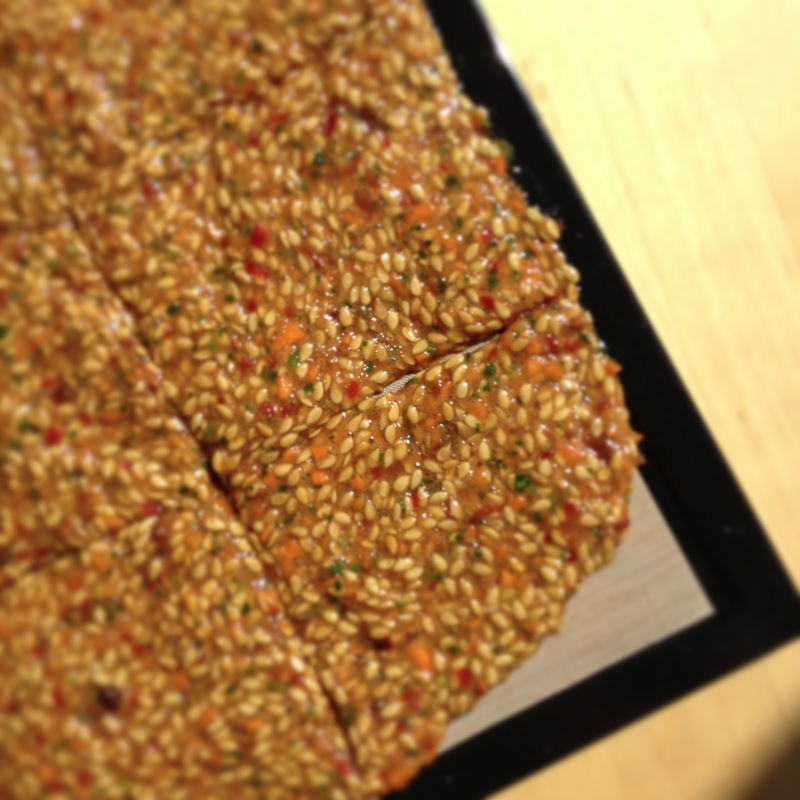 Mix in other ingredients and stir, then serve with fresh-cut veggies or raw crackers. Feel free to double this recipe if you have more than 2 people to serve. Soak flax seeds in large bowl with water for about 1 hour (until gelatinous and liquid is absorbed). Place bell peppers, sun-dried tomatoes with their soak water, parsley, rosemary, thyme, garlic, lemon juice and shoyu in food processor with an S blade on high for about 1 minute. Add flax seeds and mix well. Spread onto Teflex lined dehydrator trays. Score with a knife or spatula for easier separation later. Dehydrate at 115 degrees C for 6 hours. Flip, remove Teflex and continue to dehydrate for 6-10 hours more. Break into pieces. Good at room temp in an airtight container for a week or two. Double recipe if serving more than 2 people. 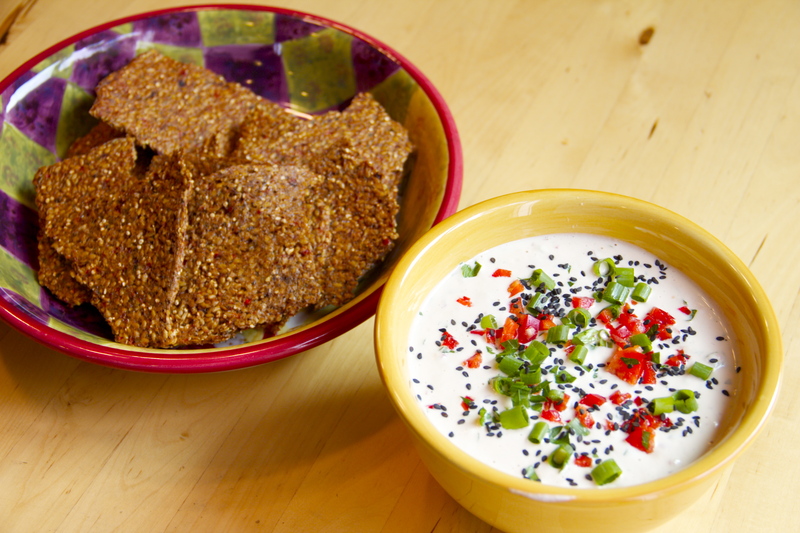 For another variation for flax crackers with slightly different spices -> click here. 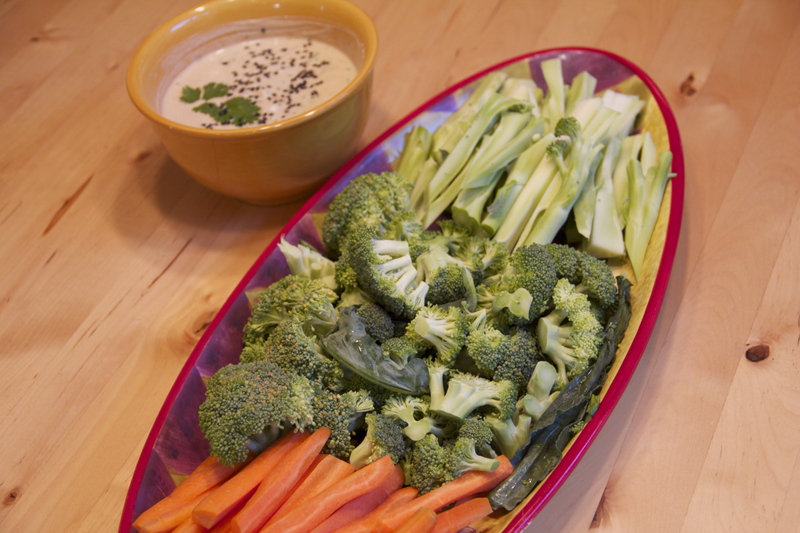 For a second option on the cashew cream dip -> click here. These foods are people pleasers, even for those who might not know what raw foods are. 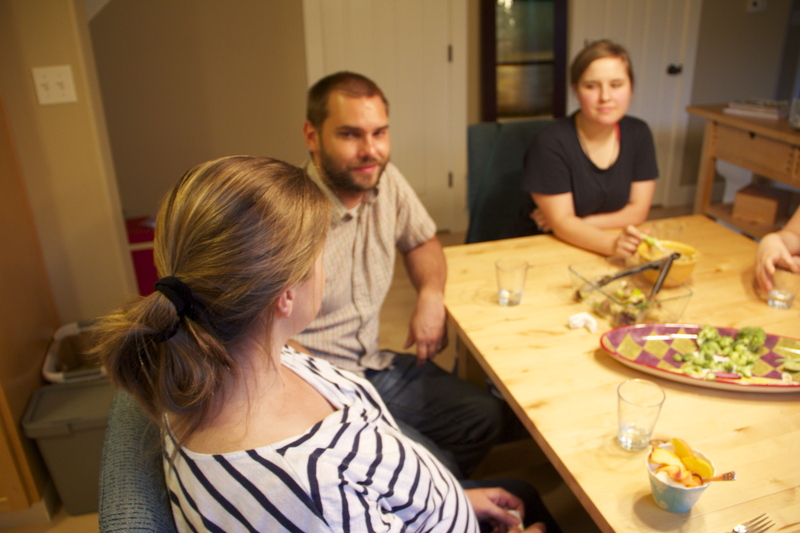 It is always good to share the best of the best to your family and guests, so they see that healthy eating can be tasty and satisfying as well as health building!